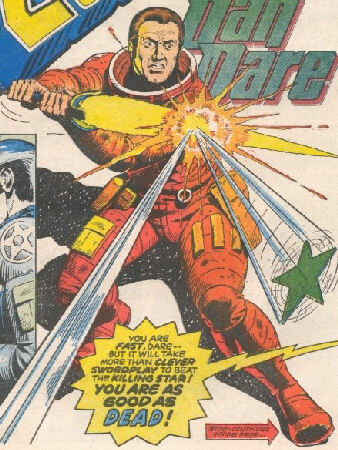 Legion serves as the first strip in the lost worlds arc which is the longest story in the 2000 AD Dan Dare series. Ultimately however rather than review it all as one series I have decided to examine all of the individual stories one by one. Dan is given a chance to command a ship once more after he was relieved of his command following the Biog’s invasion. The mission is to explore the Lost Worlds. The Lost worlds are planets in an area of space where no one has ever returned. Dan’s job is to find out what what happened to the people and rescue any possible survivors. Dan accepts the mission and is also allowed to pick his own crew. He selects criminals from the planet Topsoil 3 a free trading post planet that is a popular hangout for criminals and outcasts. Among those he picks include a strong man nicknamed bear, a hitman who is an incredibly fast shot, and a pilot named Polanski. Dan tests them all out before offering him a place on his mission. He makes it clear the risks that are involved, yet they still accept for the money. With his crew ready Dan’s ship which is really more like a flying fortress, called the Eagle travels into the area of the Lost Worlds. They are soon attacked by a horde of hideous monsters that can survive in the vacuum of space as their wings are like light sensitive panels, and thus serve as solar panels for them. 5 of Dan’s men are lost in the attack, but Dan nevertheless manages to pilot the Eagle out of the their reach and then quickly destroys the Asteroid they came from. With this path to the Lost World cleared Dan and his crew venture forward to face new unknown dangers. Legion is not as strong as the previous two Dan Dare 2000AD stories. Its much shorter obviously, and its artwork is not as impressive. Dave Gibbons is a very talented artist in his own right and his artwork certainly isn’t bad, but still it is a shame after the wild and crazy images Belardinelli came up with to go back to what is more straight forward art work. Still in all fairness this story doesn’t give Gibbons as much of a chance to really flex his artistic muscle’s as much as the previous two stories did Belardinelli, with most of the characters save the fairly bland monsters at the end just being ordinary people. Still there are some imaginative designs in this story such as Dan’s new spaceship The Eagle. I also felt it was quite a nice touch to name Dan’s new ship The Eagle after obviously the comic that ran the original Dan stories in the 50’s and the 60’s. The story also does feature a number of intriguing ideas. The basic idea of the Lost Worlds is interesting. Kind of like a Bermuda Triangle of space where space pilots mysteriously vanish. It also allows this series to break out of the formula of just being Dan vs the Mekon all the time. As much as like the Mekon it is true that at times he could suffer from over use, like any great enemy and thus its good that this series gives Dan a chance to battle other monsters and go on different types of adventures. The idea of Dan’s new crew being a group of criminal’s to explore is also a brilliant concept. Its basically the Dirty Dozen in space and really helps this series to stand out from its predecessor. In the original Dan Dare series his crew was made up of fine upstanding professionals who were in some cases meant to be role models to the readers like Professor Peabody. Here Dan’s crew are the scum of the galaxy with the implication being that Dan has selected them as much for the fact that no one will miss them if they are gone as for their skills. It is also hinted that this why the Federation sent Dan on this mission as they view him as expendable. Through the character of Bear we also finally get a character that lasts for than one story. Sadly though Bear is so much blander than Monday, Doctor Rodan, or Rok. Monday was an 8 foot tall fifth generation Martian with long white flowing hair who had a tense, brothers in arms dynamic with Dan, Doctor Rodan was a genius scientist and a possible love interest for Dan, Rok was a Wolfman from space who was a Dan fanboy and would follow him to the ends of the earth. Bear is just a big strong guy whose dumb, likes to break things and refers to himself in third person a lot. Still I suppose at the same time you could also say that Bear whilst blander is also not just an expy of a character from the original. Doctor Rodan and Rok could be seen as expy’s of Professor Peabody and Sondar. Genius female scientist and proud alien, warrior guy. With the Bear I suppose they were going for a totally different type of character at least. This story about a Dirty Dozen in space was one year before Blake’s 7 would explore a similar concept of the Dirty Dozen in Space to massive acclaim. In all fairness though I think its probably just a coincidence. After all whilst this was before Blake’s 7, Blake’s 7 would probably have already been in production. Still I nevertheless think its worth comparing this story to Blake’s 7 anyway as I feel it shows how popular sci fi was towards the end of the 70’s drifting towards a darker grittier area, with characters who were more unsympathetic and much more likely to die. We can see that reflected perfectly in Dan Dare and Blake’s 7 from round about this time. Overall whilst not the most involved or exciting story in the series, Legion still does a decent job of setting up the exciting Lost World’s story arc as well as featuring some interesting ideas itself. This is the first 2000AD Dan Dare strip not to feature the Mekon. This was originally published on the 3rd of September 1977.